You are at:Home»Articles»Is Your Portable Water Filter a Cheap & Dangerous Overseas Knock-Off? After doing several reviews on various water filters here on Portable Water Filters I considered the idea of starting on online store to sell the better quality brands I felt I could stand behind. Naturally, the first step is to search out wholesale sources for each brand. As most of us do these days, my first stop was Google and my search begins. The results that Google provided were a little surprising and the first ones offered up were from Alibaba.com and Allexpress.com. If you are not familiar with these websites, I’ll provide a quick run down… in the simplest form, the are platforms that connect global buyers to Chinese manufacturers for almost any type of product you can think of. Alibaba.com alone has a reported 2015 revenue of nearly 12 billion USD – which means they connect a lot of buyers to a lot of sellers. A lot of these sellers manufacture portable water filters… and you may have guessed it, many of these filters closely resemble some of the most popular and reputable brands available, such as LifeStraw, Sawyer, Katadyn, LifeSaver and others. Check out a few products here on Alibaba.com that I found – many are so close in appearance to major brands it is somewhat alarming. I then did a search on Amazon.com for portable water filters and the results were equally alarming – many of the products I found on Alibaba,com are for sale on Amazon.com. Lets face it, when you buy a water filter it “MUST” do what you expect or you risk getting ill, very ill if your water source in question is considered high risk, such as might be found in Africa, India or other areas of the world with water borne life threatening viruses, bacteria and so on. You cannot afford to take any chances, and buying water filters from unknown sources which are not backed by reputable companies is risky – very risky! Now, I am not saying all these filters are risky, poorly made water filters. Some overseas manufacturers may adhere to high standards hoping to build a good reputation, however, I think most people will agree when I say, “For every good quality product made in China, there are 5 inferior products made”, you only have to go shopping at any Walmart or other large department store to verify this. Quality brands who have established a very good reputation that you can trust is vital to ensuring you have purchased a portable water filter that will protect your health and well being. What Brands Can You Trust? Well, first. let me say, I would not trust any brand that I have never heard of before. Secondly, if you buy a no-name brand and get sick, I would wager, that you would pay ten times the price of the most expensive brand name water filter to feel healthy again! Thirdly, be sure to buy from a well known source like Amazon and make sure the products is “Shipped and Sold by Amazon” or at least sold by the company that manufacturers the water filter or is an approved dealer for the manufacturer (usually a list is available on their official website). There are only four brands at this time that I would trust when it comes to “Portable” water filters (sometimes referred to as personal water filters). These brands are large companies that cannot afford bad press and products that do not perform as described. I’ll list these below and briefly why I would choose them. I own almost every product made by LifeStraw and recently ordered the LifeStraw Mission (which looks great and I will provide a review on it soon). 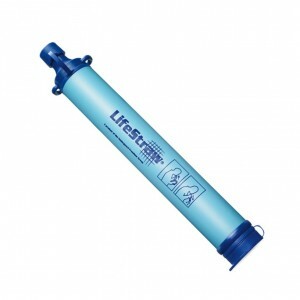 I would love to get the LifeStraw Community but it is a bit beyond my needs and price range at the moment. 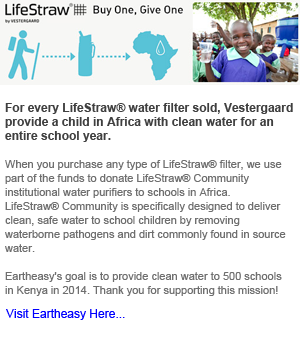 LifeStraw is manufactured by Vestergaard Frandsen, Switzerland, and the company has many initiatives it can be proud of. They are large company with the ability and resources to stand behind all their products. 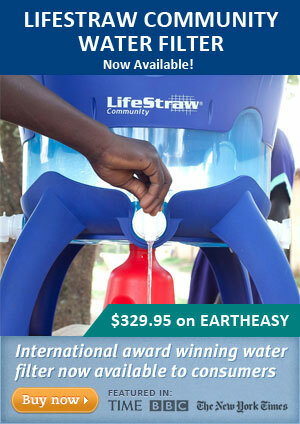 Lifestraw is selective in their choice of dealers and to the best of my knowledge, has not had any issues or bad press in regards to any of their products. This says a lot on the part of Vestergaard Frandsen and LifeStraw. In addition, Amazon reviews on LifeStraw products are a valuable resources when researching portable water filters – and let me just say, there are a ton of “Positive” reviews on Amazon. Not only that, but if you have purchased a Lifestraw product, you can see and feel you are getting value for your money – but most important… PEACE OF MIND. Katadyn is also out of Switzerland and the quality is evident in their products. They were the “First” company to produce a high-end personal water filter, in particular the “Katadyn Pocket Water Filter“. To this day, I have to say, it is one of the best made, highest quality water filters you can buy, at a price of course which is around $300. Katadyn offers a limited range of water filters, but what they do offer is high quality and reliable. They even offer a line of Desalinators. However, I do think Katadyn is lagging a little bit behind others when it comes to ease of use. For example, the LifeStraw Mission exceeds in performance and design compared to the Katadyn Base Camp water filter – and this is reflected in the reviews on Amazon. On the other hand, The Katadyn Pocket Water Filter has yet to be matched in quality and durability by a product from any other company. I hope Katadyn rolls out more products similar to the LifeStraw Mission. They need to since many buyers are leaning toward easier to use products like the LifeStraw Mission and products from other companies like Sawyer and LifeSaver. Lifesaver offers an exceptional line of water filtration products, everything from personal water bottle filters to full size industrial capacity systems. However, in my opinion, they focused to much on research and development and not sales, hence they ran into financial problems and were acquired by Icon Technologies earlier this year. In addition, they had an issue with their LifeSaver 6000 Bottle Filter and Icon Technologies had to halt production and correct the problems – which has been done and was recently certified (see the report on their website). For the most part, I would say LifeSaver products are well suited to base camps and applications which allow for the transport of water containers with a vehicle or other means of transporting larger volumes of water. 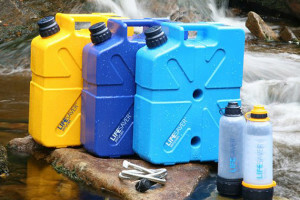 Their lifeSaver bottle are great, but will need some time to get back consumer confidence due to the recent 6000 issues. 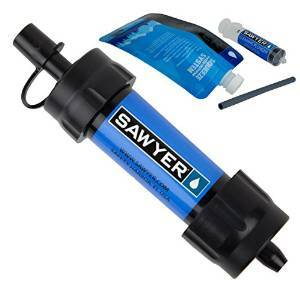 Sawyer is a fairly new player in the personal water filter industry. They have built a great reputation and there products are simple and easy to use. They focus mainly on small filters very well suited to the backpacking and camping markets. I personally own 2 of their filters and keep one in my truck and the other in my backpack. The size of their water filters make them very easy to store anywhere. Simple effective design is the Sawyer brand and I believe they will become one of the top producers of personal water filters in the near future. As noted above, when it comes to safe drinking water, you have to trust the water filter you buy 100% or it is useless – and possibly very dangerous. Some water borne illnesses can be life threatening and in my opinion, not worth risking an unknown product from a seller you have never heard of. Even on Amazon, third party sellers can sell similar looking products to popular brand names – so make sure the product in question has the brand name on it, looks as it should, and is sold and shipped by Amazon, or an authorized dealer for the brand you are buying. If not, you might receive a knock-off shipped directly from one of several overseas countries with no way of knowing if it will work or not. If it doesn’t work, you, your family, or friends, may get sick, possibly very sick if you are using said filter with a highly contaminated water source. I estimate I have over $1000 invested in water filters that I keep on hand, each suited to different situations and applications. Buying brand name products with a good reputation brings a lot of peace of mind and I feel I have little to worry about when the need arises to use any of the water filters I own. I highly recommend playing it safe and buying the best brand name water filters you can afford for the application and location they are needed. Once sick, there is no turning back, and the regret of saving a few dollars earlier on will feel like the most expensive mistake of your life – or someone you care about. Be Safe, Buy Reputable Brand Names and Enjoy Clean Water You Can Trust! After reading the warning about China knockoff products versus trusted swiss product it is very disappoint to find my Community Lifestraw is made in China S P Moulding Suzhou CO LTD. Another online article with what now appears to be “bogus facts” or at least to be very misleading. Almost all products today are made in China. The best computers and phones e.g. Apple, are made in China, as are many other high end brands. These companies have products made to their specifications and in the case of water filters, are tested and certified by respected labs to ensure they work as claimed (check their websites). What I am saying is to be careful of other manufacturers overseas (in China or other nearby countries) that copy major brand name products that could be inferior to the original but look identical or similar – and may not be tested or certified. The article does not imply that the original brands are not made overseas, rather it points out that the products are made by companies who will not risk their reputation on a poorly made product regardless of where it is made. It is about reputation and trusted brands.